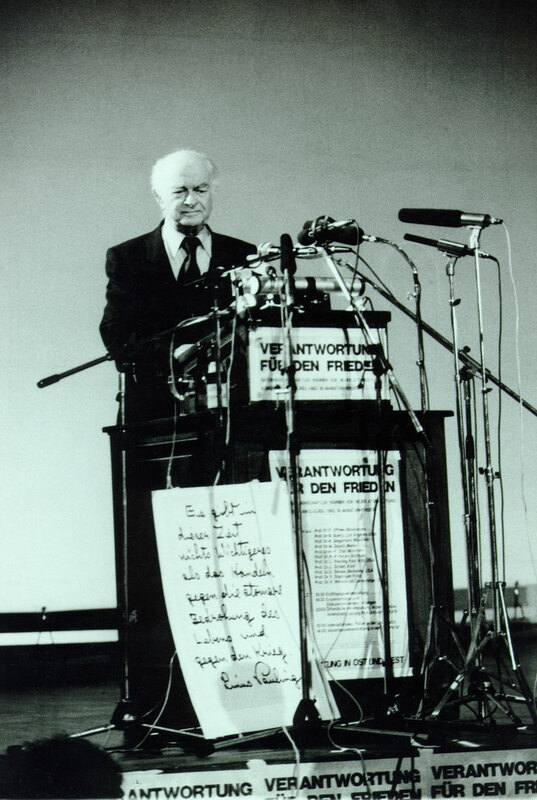 Pauling speaking in Mainz, Germany, July 1983. Since we’re in an announcing mood, it gives us great pleasure to pass along word of another new Pauling resource recently made available online by the Special Collections & Archives Research Center: a German-language edition of Robert Paradowski’s Pauling Chronology. 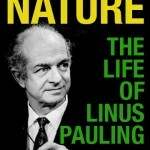 Robert Paradowski’s chronology of the life and work of Linus Pauling, which we’ve written about in the past, is surely one of the most useful accounts of Pauling’s story available anywhere and almost certainly the best general overview that one can find online. Paradowski is Pauling’s official biographer. He knew Pauling well and compiled a significant corpus of one-on-one interviews that surely contain a great deal of unique information. Those of us who spend time in the Pauling orbit have long anticipated the release of the Paradowski biography, rumored to be a three-volume work, but it has yet to see the light of day. So until the publication of his epic, Pauling watchers with an interest in Paradowski’s work have to content themselves with the Chronology, which was first published in print in 1991 and later released online by Oregon State University in 2009. Since then, we have done what we can to increase the accessibility of the text to larger audiences, beginning with a Spanish translation released in 2010. The new German edition is likewise meant to act in this spirit of increased access to a valuable resource. Future translations are anticipated as skill sets within the department avail themselves. Pauling was comfortable with language. 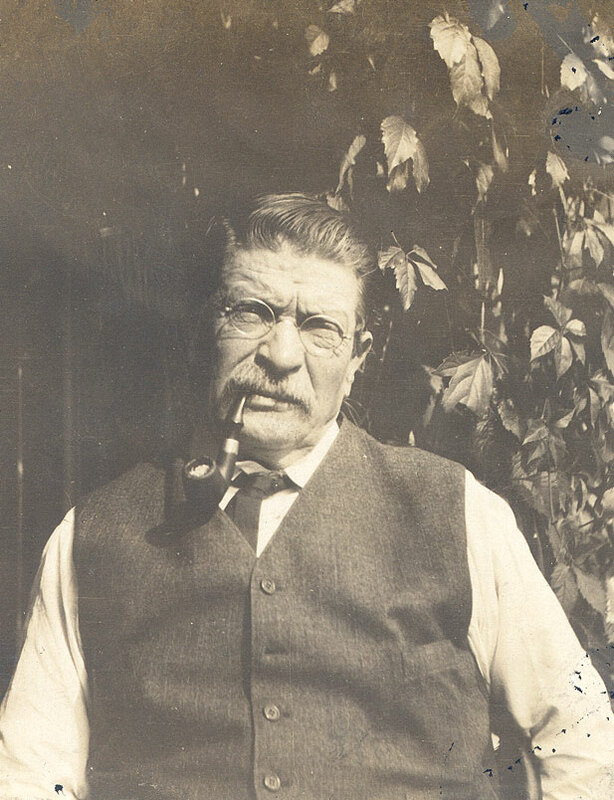 His written English was impeccable – peppered throughout the Pauling Papers, one finds numerous examples of his correcting the grammar or style of other authors – and he was comfortable delivering lectures in essentially all of the romance languages. German, however, was Pauling’s strongest second language. Pauling came from German stock on his father’s side. His grandfather Charles Henry Pauling, whom everyone called Carl, was born in the U.S. to recent German immigrants, and he eventually married a German woman named Adelheit Blanken. In 1882 Carl and Adelheit moved to Oswego, Oregon, a suburb of Portland, and stayed there for the remainder of their lives. Linus, who was born in 1901, spent a significant amount of time in his grandparents’ home, especially after his family had settled for good in Portland in 1909. As Thomas Hager notes in his Pauling biography, Force of Nature, daily life in the grandparents’ home was imbued with the culture of the old country. …the woodstove was always warm and the smell of rich German cakes filled the air. A sod cellar was packed with home-canned fruits and crocks of sauerkraut and pickles….Carl and Adelheit were devout Lutherans. Because there was no church in Oswego, every month they would invite a minister from across the river to hold services in their house. Linus sometimes sat among the small group of worshipers in the front parlor, listening to the service and hymns sung in German. This early exposure to German spoken in the home gave Linus a leg up in his later studies of the language, which included two years of undergraduate class work at Oregon Agricultural College and, later, his passing of a compulsory exam during his doctoral studies at Caltech. 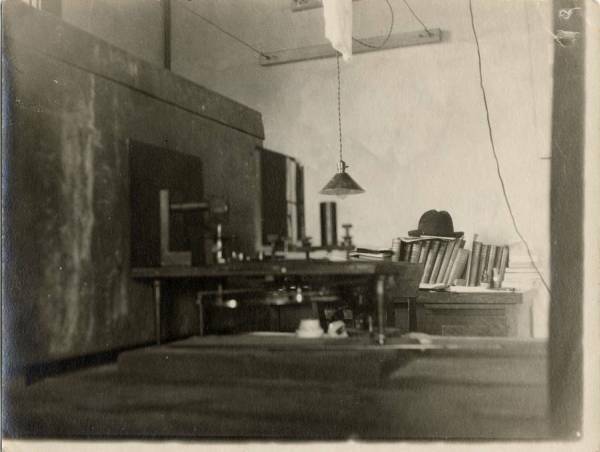 This study was of extreme use in that facility with German was crucial for a scientist in the early twentieth century. 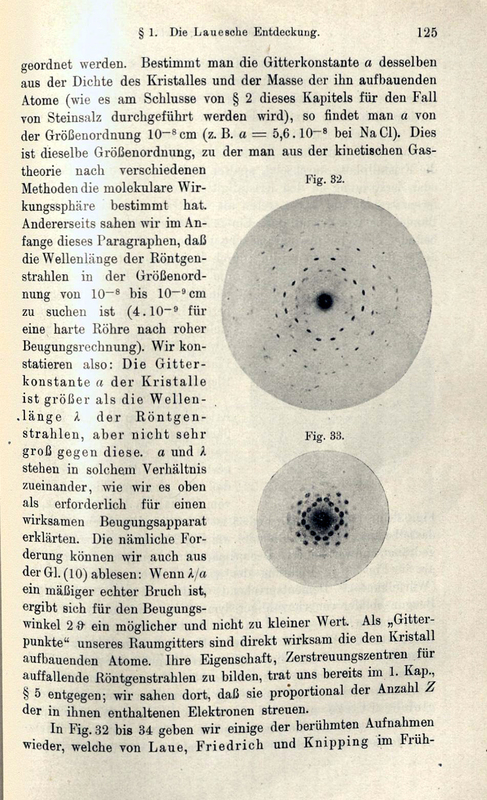 Much of the more important work in the physical sciences was being published in German-language journals and many of the leading minds were based at German universities. 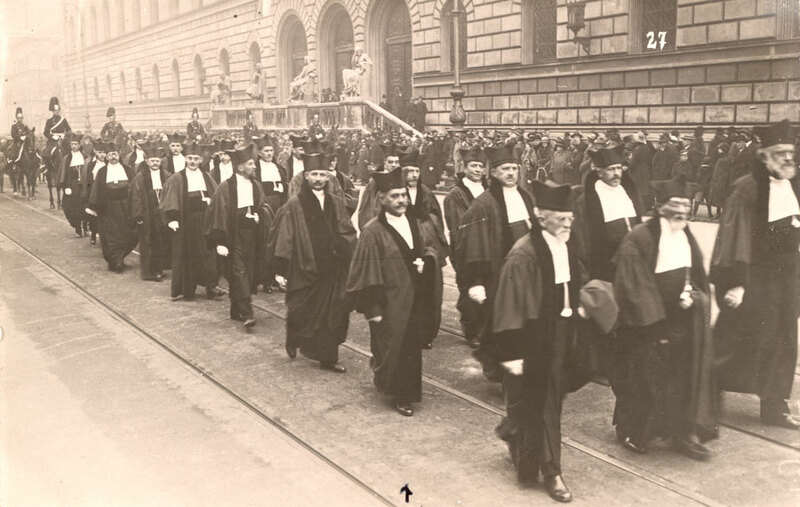 An academic procession at the University of Munich, 1927. 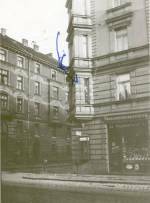 Note the arrow pointing to Arnold Sommerfeld. Photo likely taken by Linus Pauling. Pauling gained first hand knowledge of these facts during his crucially important Guggenheim trip in 1926-1927. Based mostly in Germany, Pauling made contacts with a number of German scientists including Arnold Sommerfeld, an early mentor of great consequence. 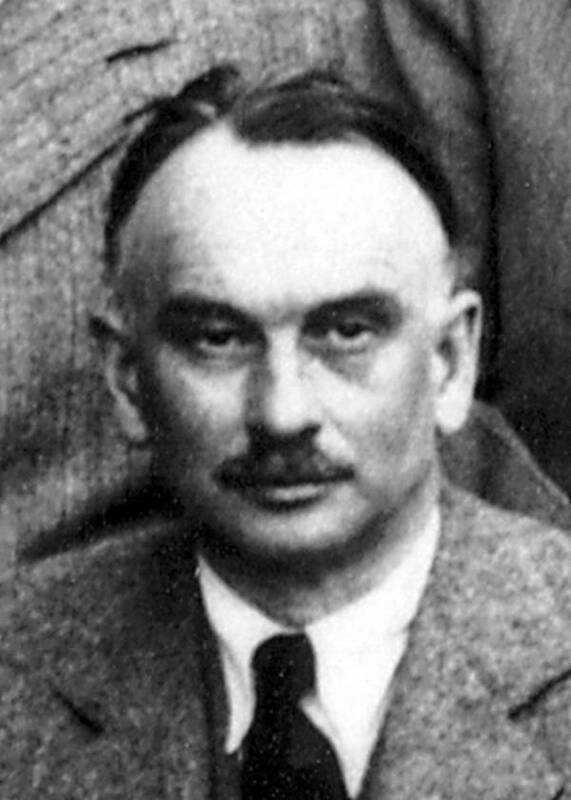 Sommerfeld’s lectures made a deep impression on Pauling and it was not long before Pauling was taking notes, writing papers and giving talks in German. This capacity only sharpened over the course of his European stay and served Pauling exceedingly well for the remainder of his life. Upon returning from Europe to Caltech, Pauling used the knowledge gleaned from his Guggenheim experience to develop his own lecture series on quantum mechanics. Among those who attended these was none other than Albert Einstein who sat in on one of Pauling’s talks in 1930. The content of this course became the foundation for Pauling’s first textbook, Introduction to Quantum Mechanics with Applications to Chemistry, which he developed with a former Ph. D. student named Edgar Bright Wilson, Jr.
E. B. Wilson, Jr., known to many as Bright, was born in Gallatin, Tennessee in 1908. After graduating from Princeton in 1930, Wilson attended Caltech and, under Pauling’s direction, received his doctorate in 1933. 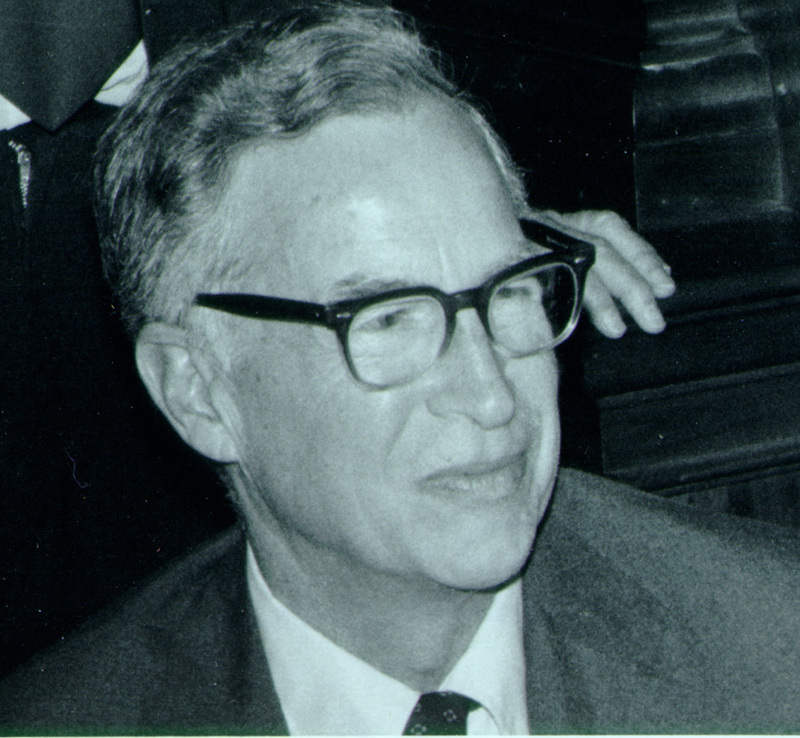 Wilson then became a fellow at Caltech until accepting a position at Harvard in 1934. In 1935 Wilson and Pauling published their co-authored text, which took the duo over two years to transform from Pauling’s original lecture notes. The primary goal in writing the volume was to “produce a textbook of practical quantum mechanics for the chemist, the experimental physicist, and the beginning student of theoretical physics,” for the authors firmly believed that quantum mechanics had applications to nearly all scientific disciplines. 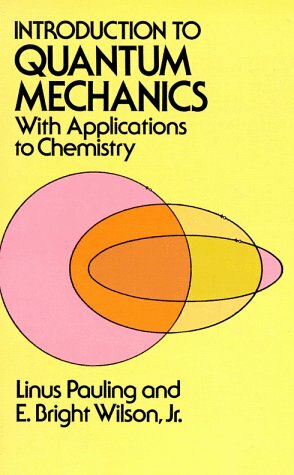 The book is particularly designed for study by men without extensive previous experience with advanced mathematics, such as chemists interested in the subject because of its chemical applications. In completing the text, the authors acknowledged a number of mentors and colleagues – many of them Caltech contemporaries – for their contributions to both the authors’ own personal knowledge and to the field of quantum mechanics: Arnold Sommerfeld, Edward U. Condon, Howard Percy Robertson, Richard C. Tolman, Philip M. Morse, Leslie E. Sutton, George W. Wheland, Lawrence O. Brockway, Jack Sherman and Sidney Weinbaum. And last, but certainly not least, the authors acknowledged their wives, Emily Buckingham Wilson and Ava Helen Pauling. In the years following publication, Wilson built a career as a highly successful chemist and an esteemed member of the scientific community. In 1949 Wilson too received a Guggenheim Fellowship, with another to follow in 1970. And in 1975 Wilson was awarded the prestigious National Medal of Science for physical sciences, just one year after Pauling. 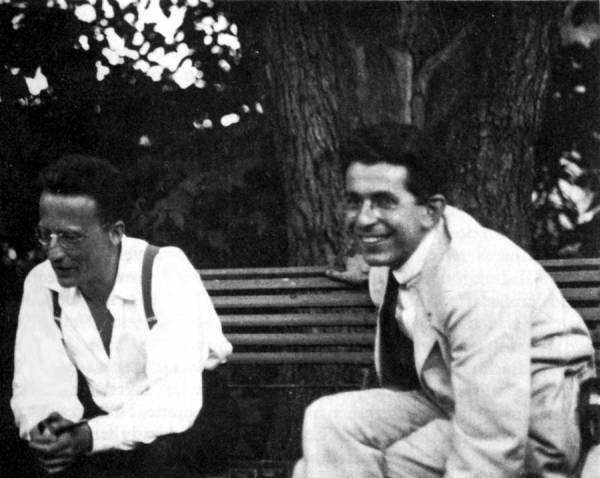 Erwin Schrödinger and Fritz London in Berlin, Germany, 1928. -Linus Pauling, “The Development of the Quantum Mechanics,” February 1929. Since 1925 the John Simon Guggenheim Memorial Foundation has annually awarded fellowships to promising individuals identified as advanced professionals who have “already demonstrated exceptional capacity for productive scholarship or exceptional creative ability in the arts.” The selection process is extremely competitive and recipients are generally esteemed in their chosen field as applicants face rigorous screening and are selected based on peer recommendation and expert review. Since the first awards in 1925, many Nobel and Pulitzer prize winners have received Guggenheim Fellowships including, but not limited to, Ansel Adams, Aaron Copland, Martha Graham, Langston Hughes, Henry Kissinger, Paul Samuelson, Wendy Wasserstein, James Watson and, of course, Linus Pauling. 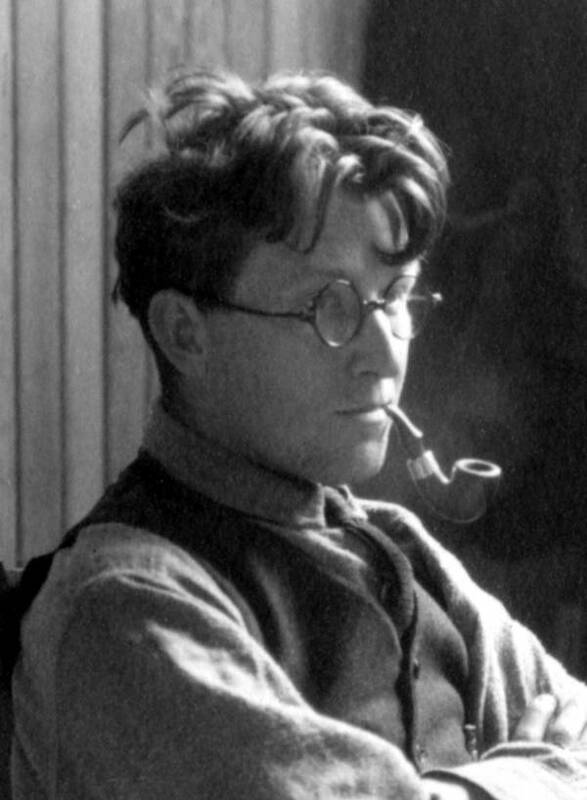 As one of the program’s earliest honorees, Pauling was awarded his first Guggenheim fellowship in 1926. Heeding the advice of his mentors, Pauling had applied for the fellowship in hopes of pursuing an opportunity for international study. Pauling’s advisers had long been insisting that he go to Europe to study alongside the leading experts in the budding field of quantum physics, and the Guggenheim funding provided Pauling with the opportunity to do just that. It was this fellowship that allowed Pauling to travel abroad in order to learn from the European geniuses of quantum physics and to later become one of the early American pioneers of the new field of quantum mechanics. Linus and Ava Helen Pauling’s apartment in Munich, Germany. 1927. –Linus Pauling and E. Bright Wilson, Introduction to Quantum Mechanics, 1935. The mid-1920s – the time during which Pauling was awarded the prestigious Guggenheim fellowship – was an exciting period to begin an exploration of quantum theory. The tides were dramatically shifting in this field of study and the acceptance of the old quantum theory was rapidly declining. 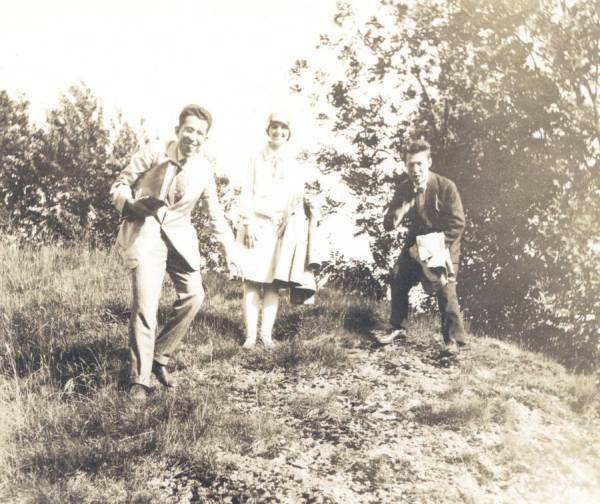 Linus and Ava Helen left for Europe on March 4, 1926, arriving in Europe in the midst of what was a great quantum theory reform. At the inception of quantum theory, physicists and chemists had attempted to apply the classical laws of physics to atomic particles in an effort to understand the motion of and interactions between nuclei and electrons. This application was grossly flawed as the classical laws, such as Newton’s laws, were originally generated to represent macroscopic systems. 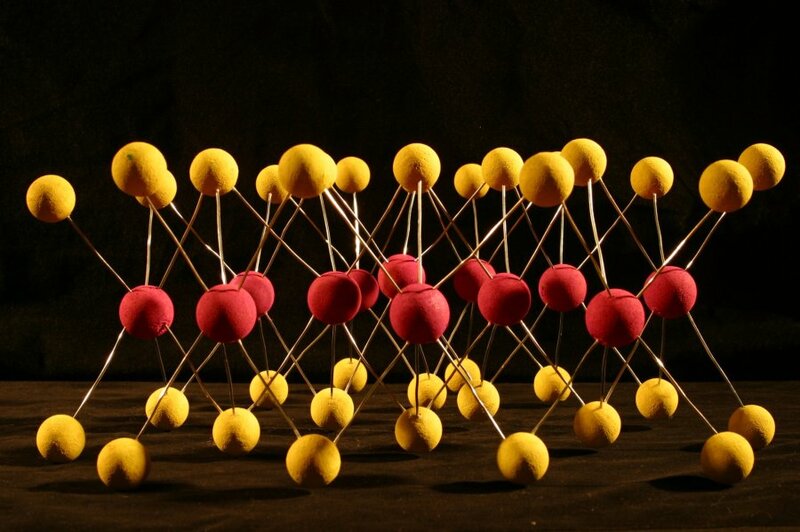 Theorists soon discovered that the classical laws did not apply to atomic systems, and that the microscopic world does not consistently align with experimental observations. A series of breakthroughs by prominent theorists in the early- to mid-1920s accelerated the decline of the old quantum theory. In 1924 Louis de Broglie discovered the wave-particle duality of matter, and in the process introduced the theory of wave mechanics. Then in 1925, just one year before Pauling began his European adventure, Werner Heisenberg developed his uncertainty principle and thus began applying matrix mechanics to the quantum world. In 1926, shortly after the Paulings arrived in Europe, Erwin Schrödinger combined de Broglie’s and Heisenberg’s findings, mathematically proving that the two approaches produce equivalent results. Schrödinger then proceeded to develop an equation, now know as the Schrödinger Equation, that treats the electron as a wave. (The Schrödinger Equation remains a central component of quantum mechanics today.) The adoption of wave and matrix mechanics led to the development of a new quantum theory and the overwhelming acceptance of a burgeoning field known as quantum mechanics. 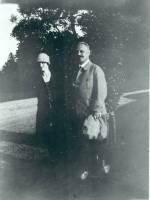 Arnold Sommerfeld and Ava Helen Pauling in Munich, Germany. 1927. Pauling began his work in Munich at Arnold Sommerfeld‘s Institute for Theoretical Physics, a scholarly environment described by biographer Thomas Hager as “a new wave-mechanical universe for Pauling.” It was this atmosphere that opened the door for Pauling to leave his mark as a pioneer of quantum mechanics. In the fall of 1926, Pauling began applying the new quantum mechanics to the calculation of light refraction, diamagnetic susceptibility, and the atomic size of large, complex atoms. Through these types of applications, Pauling developed his valence-bond theory, in the process making significant advancements in the new field of quantum mechanics and expanding our understanding of the chemical bond. Martha Chase and Alfred Hershey, 1953. It pretty well goes without saying that the primary mission of the Oregon State University Libraries Special Collections is to preserve, describe and make available the Ava Helen and Linus Pauling Papers. Beginning, more or less, with the Pauling centenary in 2001, the main focus of our Pauling-related work has been description and accessibility via the web. In so doing, we have scanned over one terabyte of data and created, at minimum, tens of thousands of static html pages devoted to the life, work and legacy of Linus Pauling and, to a lesser extent, Ava Helen Pauling. 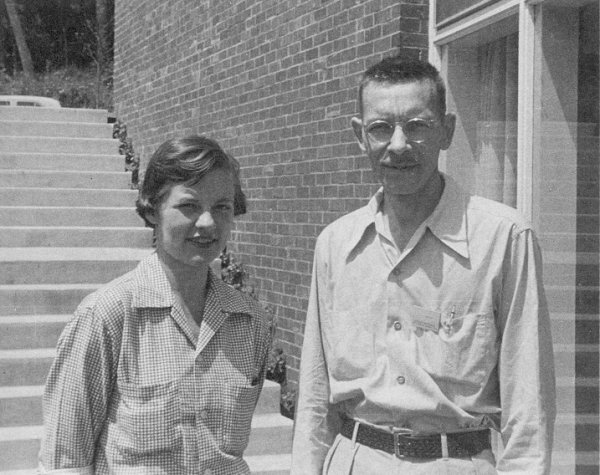 Martha Chase was a geneticist who, in collaboration with Alfred Hershey, made an important contribution to the DNA story as it played out in the early 1950s. Prior to Chase and Hershey’s work, scientists were mixed on the question as to what, exactly, was the genetic material. Many researchers, Pauling included, initially felt that the stuff of heredity was contained in proteins. Others, of course, eventually theorized that DNA was the source of genetic information. 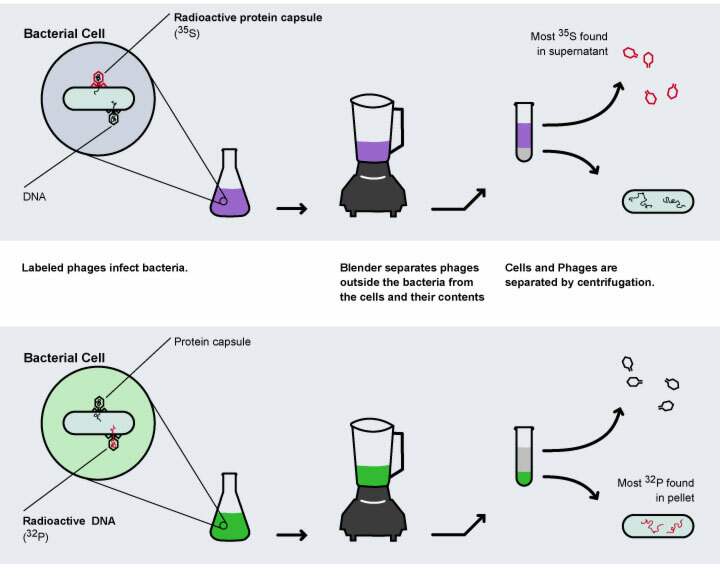 Using an ordinary blender as their primary tool, Hershey and Chase devised a famous experiment which proved conclusively that DNA did, in fact, carry the genetic code. Diagram of the Hershey-Chase Blender Experiment. Image by Eric Arnold. The breadth of Chase-related content that we have digitized is infinitesimally-small relative to the “reams” devoted to Pauling — this page and this page are pretty much it. And yet, in the context of search, Martha Chase is the top draw to our resources. It would seem then, that in the marketplace for information — at least that which is retrieved by search — supply and demand for Martha Chase approach their equilibrium at the two pages devoted to her work on our “Linus Pauling and the Race for DNA” site. Looking through the web statistics, the phenomenon is remarkably consistent. Not only has “Martha Chase” been the top search query for our domain over, essentially, the past four years, it was also the top search query for our domain over the final week of 2008. Indeed, the trend has strengthened to the point where today, those who conduct the simple “Linus Pauling” search in Google will note “martha chase” as a recommended search related to Pauling, though in reality the two had little or no interaction at all. Looking forward, the Chase Effect has become something that we’re thinking more and more about as we begin to develop new projects for the web. Our top objective will always be to document Pauling’s impact on any number of fields, but in so doing there likely exists a great deal of opportunity for serving different user groups from what might be called “Chaseian” corners of the web. To use the old many-fish-in-the-sea analogy, there is a lot of content related to Pauling on the Internet, and though we are the primary contributor to this content, we do compete for pageviews with scads of other extremely diverse projects. (Take a look at the results for the simple “Linus Pauling” Google search to see how diverse the content providers really are.) So it’s pretty clear that the Pauling sea is quite large and filled with all manner of creatures. By comparison, Martha Chase represents a much smaller body of water and, in particular, image searches for her — which is probably where the lion’s share of our successful Chase referrals come from — are dominated by the osulibrary.oregonstate.edu/specialcollections domain. The idea for future work is to think of the Pauling Papers as a collection of collections in attempting to uncover more Martha Chases. To an extent we have already, somewhat unwittingly, done this with certain of the Key Participants highlighted on our various documentary history websites. The Harvey Itano Key Participants page, for example, is the second result returned by Google for “Harvey Itano” searches. Erwin Chargaff‘s page is seventh, Arnold Sommerfeld‘s page is eighth and Edward Condon‘s is tenth, to name a few more examples. In each instance, by developing mini-portals related to specific colleagues important to Pauling’s work, we have created resources that help meet the information demand of a non-Pauling user base. As we standardize our metadata platforms — upgrading older projects and maintaining the standard for new — and, in the process, increase our capacity to “remix” our digital objects, the idea of enhancing existing mini-portals and creating new ones will emerge as an important consideration for our digitization workflow. This is something that we’ll be talking a lot more about in the months to come.